A quicker response is the better response, especially when it comes to intruders. Priority Response is a process adopted by law enforcement and dispatch teams. It means that video-verified alarms are seen as crimes in progress, and police are immediately sent to the scene. An intruder breaks into a construction site (for example), walks in front of a MotionViewer and trips the motion sensor component which instantaneously triggers the camera to record 7 seconds of video. The MotionViewer then sends the video clip to the control panel wirelessly over military-grade, AES-encrypted RF. The control panel transmits the video clip over cellular to a professional, 24/7 central monitoring station for alarm verification. Upon reviewing the video clip and verifying that there is an intruder on site, the monitoring operator will initiate an immediate dispatch to law enforcement. If the video shows a raccoon or deer on site, the operator will ignore the alarm event. Law enforcement treat a video-verified alarm as a crime-in-progress and respond with top priority. Faster police response means a greater likelihood of arrests and reduced losses. In residential security, verification is especially critical to know whether an alarm is legitimate or not. Police give priority response to video verified alarms, treating them as a crime in progress. Installation is easy. Since Videofied is completely wireless, installing a system requires no cables, drilling or modifications to the home. In addition to interior devices, Videofied can also protect outdoor assets: external garages, backyards, pool areas and more all on the same system! False alarm fines can be a huge expense in the retail world and impact the bottom-line. Videofied is not only a great way to eliminate fines and provide greater protection to the business but also, importantly, has been shown to improve arrest rates for organized retail crime (ORC). Videofied can be installed as a cost-effective add-on to an existing alarm system so employees do not need to learn a new system at all. In addition to the front doors, loading docks and warehouse, Videofied can be used in non-traditional places like outdoor storage lots, rooftops, or even vacant adjacent spaces in the strip mall. Videofied MotionViewers deliver greater security than unmonitored cameras and DVRs. They detect intruders and immediately send the alarm/video to a central station for review and dispatch. Because they are not continuously recording, there is no concern about documenting consumption by underage minors and other events that are recorded by traditional surveillance systems. Videofied can protect the bar, cash room and other high value targets. The easy installation and superior protection make Videofied an ideal solution for restaurants. In for the night? With a press of the touchscreen, this mode arms pre-selected interior sensors such as in a basement or on the main floor while letting you move freely in areas like hallways or upper floors. Videofied is ideal for protecting offices and businesses, functioning as a normal alarm system but delivering greater protection with video verification and priority response. Videofied can be installed as a new �standalone burglar alarm� if there is no existing alarm system. Videofied is also available to �upgrade� existing traditional alarm systems with video verification and greater security. Videofied is great for a wide variety of school applications: building entryways, computer labs, HVAC units, athletics facilities (even remote equipment storage and stadium press boxes) and more! Since school facilities often have hundreds of sensors, adding Videofied as an upgrade for specific areas can be especially simple and cost effective. A Videofied system can be integrated into an existing alarm system so there is no new training or codes / badges to reissue. Videofied can also be a �stand alone� system with its own arming/disarming keypad to provide separate video verification in high value areas within a campus. Videofied is the only security product endorsed by the National Sheriffs' Association. "[Survey respondents] indicated that the video technology associated with the system allows Central Station operators to provide responding officers with information on the number of intruders, their descriptions, and other information, increasing the probability of apprehension and arrest." Videofied is a great solution for HVAC units because it is verified, no dispatching the police to catch geese landing on the building! The system is especially easy to install on rooftops because it is wireless, eliminating the need to drill holes, run cables and other special concerns for rooftop installations. Unlike many HVAC switches and contacts, MotionViewers can be installed well away from the actual HVAC units, so installers don't need to be messing with the HVAC units themselves and potentially exposing your company to unnecessary liabilities. Videofied can be installed anywhere there is a cell signal � no need for power cords, phone lines or internet services that construction sites often lack, especially in the early stages. Since construction sites are usually uncontrolled environments, video verification is especially important to eliminate costly false alarms and deliver priority police response when there is an actual crime. Videofied's portability means it can be moved around as the project evolves � even if that means being installed months later at a brand new site! Videofied is a great solution for vacant properties because it requires nothing from the building itself- no power, phone line or internet connection! Since the Videofied system is portable, it can be relocated to new facilities if the building ends up getting sold or torn down. A prox tag can be left in the lock box for realtors to arm and disarm the system using the badge reader or it can be put on a 7-day schedule for auto arm and disarm. Videofied is a great tool for scrap and recycling centers because it provides immediate notification, not after-the-fact footage. Since the Videofied system is portable, it can be relocated as inventory levels change and metals are moved around. Videofied can be a great compliment to existing CCTV installations. Videofied gives the alert to the monitoring station for dispatch and the CCTV system provides additional info for follow-up! Videofied can be great for protecting vehicle lots from vandalism as well as tire, battery or catalytic converter theft. Since the Videofied system is portable, MotionViewers can be moved around to protect different areas as vehicles move around. Videofied can be a great compliment to existing CCTV installations. Videofied gives the alert, the CCTV system provides additional info for follow-up. Videofied is a great solution for fenced lots because it provides notifications when break-ins happen and before the damage is done, not after the fact! Unlike traditional outdoor sensors, Videofied's built-in camera can help central stations distinguish true break-ins from animals or non-emergencies. Since Videofied is outdoor-capable and portable, the system can be moved and adjusted as inventory levels change or machinery moves. Energy companies require a security solution for substations that is effective, affordable and scalable--Videofied is the answer! Unlike CCTV cameras or DVR-based systems, Videofied does not need to be on the substation�s IP network. All communications can happen over the cell network. Videofied 900MHz RF is military grade and operates in the difficult substation environment. 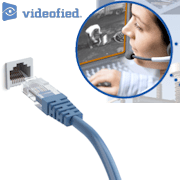 Videofied MotionViewers can be placed to protect the copper grounding cables as well as the cable troughs. Videofied alerts companies about break-ins when they are occurring so action can be taken immediately, before the actual damage occurs. Video verification is crucial for critical infrastructure because a few extra minutes in response could mean potential outages and significant costs to repair. 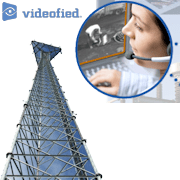 Cell towers require a security solution that is both effective and scalable--Videofied is the answer! Unlike CCTV or DVR-based systems, Videofied alerts companies about break-ins when they are occurring so action can be taken immediately. Cell tower companies can use the outdoor prox tag reader, a built-in schedule or a smartphone application to arm and disarm the system. Videofied is great for parks & recreation applications because it can be installed to protect skating rinks, gazebos, municipal swimming pools and other facilities that don't have AC power or a phone/internet connection. Since the Videofied system is portable, it can be relocated to new facilities and projects over the course of the year. Videofied can be programmed on an automatic arming schedule so no interaction is required from a park employee once the system is deployed. Videofied can be great for protecting new cars in outdoor lots once the dealership is closed for the day. Since the Videofied system is portable, MotionViewers can be moved around to protect different areas as inventory shifts. Mounting MotionViewers directly on the cars using magnetic mounts protected by leather pads is one easy installation option. Videofied can be a great compliment to existing CCTV installations. Videofied detects the intruder and sends the alarm/video for immediate review. Once alerted, the owner can log into the CCTV system for additional follow-up. Warehouses often harbor birds, mice, bats and other sources of costly and annoying false alarms so using video to verify alarms before dispatch is especially important. For warehouses that are not climate controlled, Videofied's outdoor MotionViewers can withstand temperatures from negative 20 to 140 degrees Fahrenheit. Because MotionViewers are wireless and need no power cord, they can be moved and repositioned as the inventory shifts or reconfigured to protect pallets of high value goods. Storage facilities often hold millions of dollars-worth of inventory and are targets of cargo theft. Video verified alarms and priority response from law enforcement is crucial to reduce insurance claims. Videofied can be installed with only a cell tower signal for communication � no need for the traditional AC power, phone line or internet requirements that remote sites often lack. Since many remote sites are unfenced, uncontrolled environments, video verification is especially important to eliminate costly and wasteful false alarms. Videofied's portability and wireless/cordless design means MotionViewers can be moved and repositioned as the project evolves � even if that means being installed months later at a brand new site! Videofied is a great tool for protecting agricultural machinery, ammonia anhydrous tanks, piles of harvested sugar beets, irrigation equipment, remote grain storage and agricultural fields themselves. Videofied can be installed with only a cell tower signal � no need for the traditional AC power, phone line or internet requirements that agricultural sites often lack. Since agricultural sites are usually uncontrolled environments, video verification is especially important to eliminate false alarms and deliver priority response from Law Enforcement. Video verification with priority response can be especially critical for pharmacies that stock oxycontin and other drugs in high demand by thieves. Some pharmacies use Videofied MotionViewers to secure rooftops, and above the plenum areas that have been targeted as easy entry points by thieves. MotionViewers can be easily installed in off-limit rooms or inside storage cabinets where the particularly valuable drugs are stored. A Videofied system can be integrated into an existing alarm system so there is no new training or codes / badges to reissue. Copper theft can happen anywhere and usually does...that's why you need security that can go anywhere to protect remote assets outdoors. If there is a cell phone signal available, we can protect it. Since Videofied requires no power and is completely wireless, the system can be installed during early-stage construction projects, before the IP networks and fences, when copper is most vulnerable. Videofied provides a video of the intruder as the crime starts for immediate review/dispatch, so you don't find out about break-ins and damages hours or days later!